This article is about the Keyblade used by Terra, Ventus, and Aqua. You may be looking for the Keyblade used by Luxu and Master Xehanort. "A Keyblade with long reach that provides an outstanding boost in Magic and makes it easier to land critical hits." The No Name is a Keychain for Terra's, Ventus's, and Aqua's Keyblades that appears in the North American, PAL, and Final Mix versions of Kingdom Hearts Birth by Sleep. Terra, Ventus, and Aqua are rewarded with the No Name for defeating the Unknown. The No Name Keyblade is predominantly colored in different shades of blue and is decorated with elaborate, spiked shapes. The tip of No Name appears to be a stopwatch, while the teeth are diamond shape spikes that are connected by a black web structure similar to the design on the base of the top spire of Memory's Skyscraper. 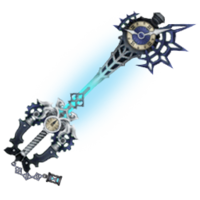 The Keychain shares the time theme represented in the blade, and its token is an hourglass. The shaft of No Name resembles Xehanort's Ethereal Blade-like weapons, and the blade features an ever-present glow. The name "No Name" might reference the mystery surrounding Xehanort's identity during his time as the "Unknown". In-universe, the name is borrowed from the ironic name that Luxu gave his Keyblade. ↑ Only available in the original English and Kingdom Hearts Birth by Sleep Final Mix releases.